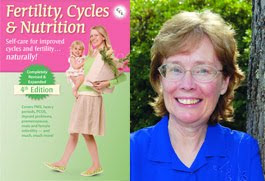 Marilyn M. Shannon (author of Fertility, Cycles and Nutrition) had a healthy baby at age 47 (almost 48) without using fertility drugs. Ron and Marilyn are the parents of nine children, ages 30 to 3. Their seventh and ninth children were adopted as babies, and their eighth was born to them shortly before Marilyn’s 48th birthday. The Shannons live on a small farm in Indiana, where the family interests include raising dairy goats, sheep, and chickens, gardening, and beekeeping. Marilyn and her husband Ron have been a Teaching Couple for the Couple to Couple League for Natural Family Planning (NFP) since 1982. Her interest in the impact of nutrition on reproductive health is an outgrowth of her educational background and her experience as an NFP instructor.